As we inch closer and closer to Christmas day, I find myself adding more and more rum to my eggnog, and my wine glass never stays empty for more than 5 minutes at a time. Perhaps I’m trying to numb the horrific stress that unfortunately is tied to Christmas cheer and festivities, but all the planning, shopping, and endless amounts of running around is so freaking exhausting! If you recall, I’m on a mission to give all edible gifts this year, and I currently I have about 300 cookies sitting in my kitchen, waiting to be packed up and delivered with a fake smile. Well basically, I spent all of Friday morning and afternoon rolling, kneading, coating, and decorating a ridiculous amount of different doughs and batters. You don’t even want to imagine what my kitchen looked like by the end of it. I’m quite positive I’ve developed a mild case of carpal tunnel from rolling out about 400-500 cookies by hand. But after a whole day of sitting next to and talking to the oven while my little cookies baked, I gotta say, it was so worth it to see how much everyone loved them! Growing up in an Asian household in Canada, Christmas was an odd concept for me to grasp. Back in Hong Kong, Christmas just meant grossly warm weather, a traditional dinner with my extended family in a restaurant… and that was pretty much it. So imagine how much of a culture shock it was for me, coming here when I was 3 years old! Suddenly I was knee deep in snow, sitting on santa’s lap in the mall, and actually had a house big enough to fit a Christmas tree. The weirdest thing for me to get used to was definitely Christmas food though. I mean, things like sugar cookies were easy for me to like since they’re so neutral and easily palatable. 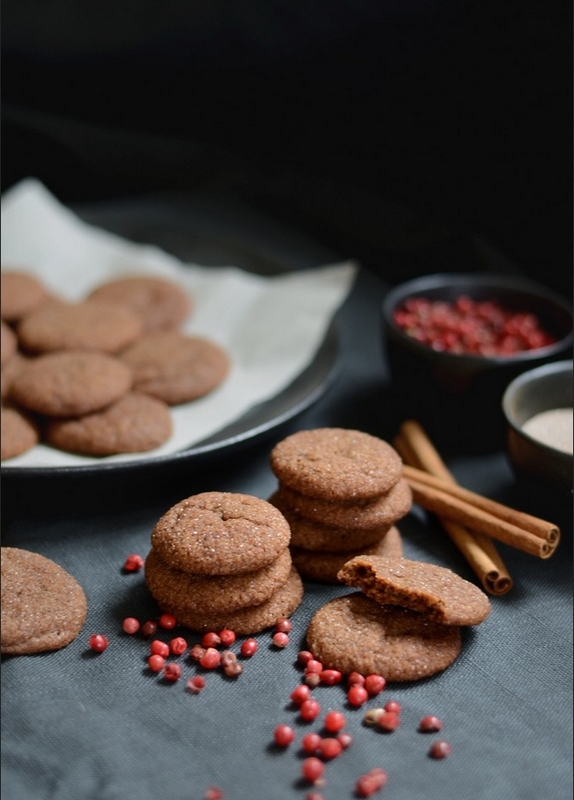 However, when it came to things like gingersnaps, gingerbread, or anything with cinnamon…. that was a different story. I remember baking gingersnaps in pre school, and I literally chewed on it, decided that I hated it, and spit it out onto my friend’s lap. 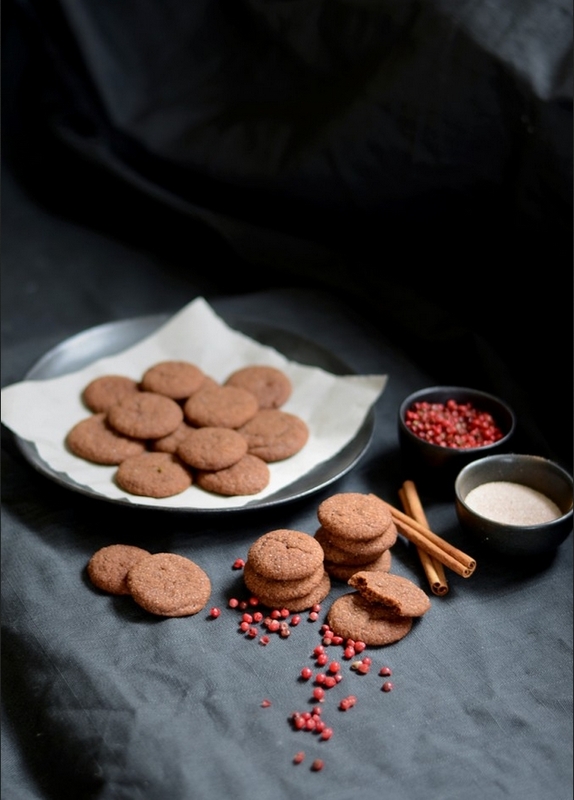 But over time, through lots and lots of training and peer pressure, I can definitely say that I now love gingersnaps and all sorts of goodies with a similar taste profile. It only took me 15 years to get used to (ha!). I was super determined to make a good gingersnap this year, and I think I nailed it on the head. 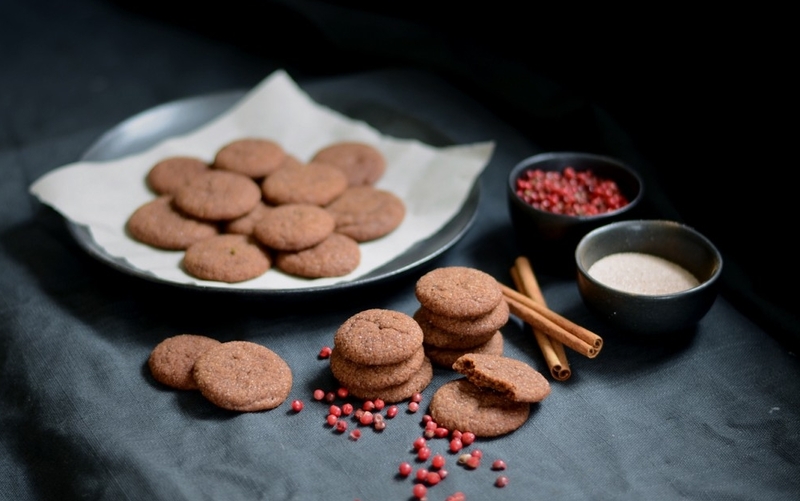 These guys have the most delightfully crisp exterior that just melts into the most chewy and spicy insides with flavours kinda like what you would imagine (or hope) a gingersnap/gingerbread Christmas candle would taste like. Also, it’s super easy to just make a big batch of cookie dough and just stash it in the freezer until you need it. I mean, you need to chill it so that you can properly roll it anyways, so there’s no waiting for it to thaw or anything! However, if you leave it out too long… you’re gonna have one hell of a sticky mess. 4. Sift together your dry ingredients and then mix in 3 or 4 separate partitions to the butter, sugar, and molasses mixture. You should have a wet, sticky dough that’s quite loose for a cookie dough. 5. Wrap in cling film and toss into the fridge until very firm. 6. Mix together the sugar and cinnamon to make the cinnamon sugar. 7. Take the dough out of the fridge, and cut out little pieces to be rolled into balls 0.75″-1″ in diameter, before tossing it into the cinnamon sugar. 8. Place the little balls at least 2″ apart from each other, and then bake for 12-15 minutes. The less you bake it, the chewier they will become!